Holly Shaw: Would You Like Some Spam With That? Or some ham or jam? For all the lovely years of our union (soon to be 12) there has been someone between us, or should I say a few people. A British comedy troupe from the late 60s and early 70s that is currently disbanded. Yet, their power is still strong. As a girl I have never paid much attention to Monty Python. I just never "got it". Many of my girlfriends feel the same way. Now, if you talk to guys, of varying ages, Monty Python is "The Man" (or should I say "The Troupe"). Scott is no different. He can quote entire scenes of dialogue from Monty Python and the Holy Grail and then laugh like he was 8 years old again. Often he and other grown men do this. I still don't get it. 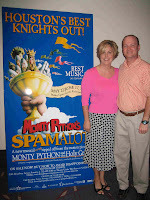 Anyhoo, as a combination Christmas/Birthday surprise, I gave him tickets to see Spamalot, which is a musical spoof of Monty Python's Holy Grail. Needless to say, Scott was over the moon. Soon word got out and various grown men came up to him at church to discuss this and how cool it was. I guess I did good. A couple of Saturdays ago we went to see it. I never knew Scott could drive so fast. Or walk so fast in front of me to get inside (and we HAD PLENTY OF TIME). He was just, shall we say, excited. While I still don't "get it", and will continue to roll my eyes when he quotes MP, I will quietly admit that parts of it were pretty funny. Shhh. Here are some other birthday goodies Scott enjoyed. A chocolate cake with sprinkles, a card made by A. (with all the punched & glued hearts, it's her thing), and several other birthday cards from friends. His friends at work bombarded him with cookies (it WAS an onslaught) and he was high on sugar for days. The only thing to say is that MY Scott's the SAME way! Did you know that a couple at church actually went to this for their ANNIVERSARY!? Ha! What can I say..I don't get it either! Glad he enjoyed his birthday! I enjoy Monty Python's comedy cd and listen to it every now and again. There's a hilarious sketch about a man wanting to buy a fish license for his pet fish Eric, that's one of my favorites. So actually last week I was on the phone with my husband trying to say the name Eric and he said "what?" and I said "Eric, like the fish." That's random eh? Like you, I never got the Monty Python thing. Thank goodness, my man doesn't either! You're one loving wife!